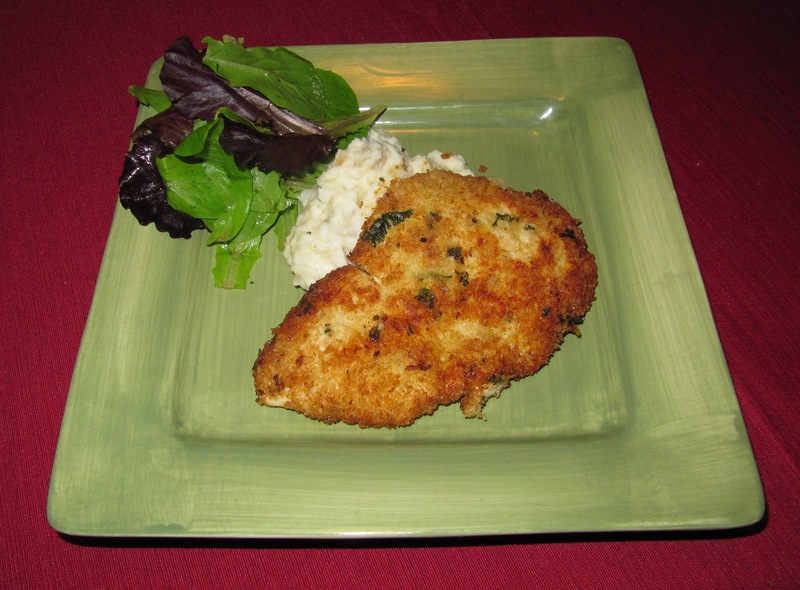 I have been craving crispy chicken lately, so I decided to use some leftover panko breadcrumbs to create chicken milanese. I thought to pair this with some creamy mashed potatoes to provide a contrast in texture. To begin I pounded out some chicken breasts until very thin and spread out. I sliced my chicken breasts in half first before flattening to make them more manageable. I added the flattened breasts to a dish and covered in plain kefir for about 20 minutes. 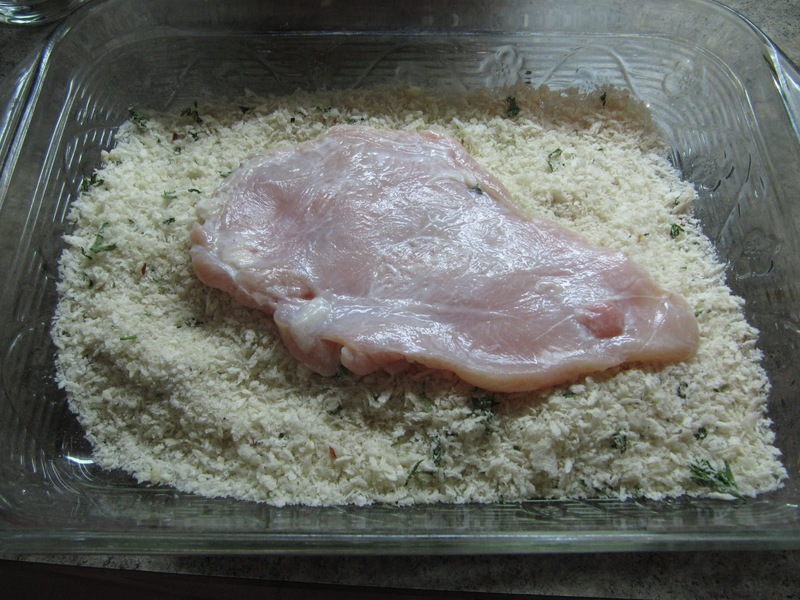 I did this to further tenderize the chicken and it also acts as a glue for the breadcrumbs. In a flat dish I combined panko breadcrumbs, minced garlic, chopped parsley, red pepper flakes, salt and pepper. 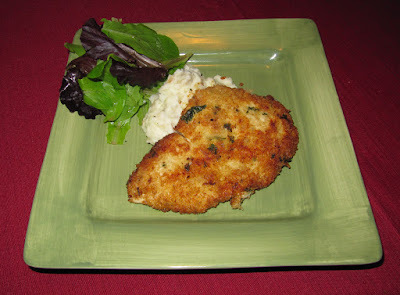 I coated the chicken breasts with the breadcrumb mixture to cover both sides. I covered the bottom of a skillet with olive oil and added my chicken. I let the chicken fry away for a few minutes on each side, making sure to get a crisp, golden-brown crust on each side. While I cooked the chicken, I boiled potatoes in water until very soft. I cooked these for longer than I normally would to assure that they come out very creamy. I strained the potatoes and mixed with sour cream, milk, and garlic that I sautéed in butter. to complete the dish I leaned a piece of chicken milanese on a mound of mashed potatoes that I placed at the center of the place. I added a simple salad with greens tossed in lemon juice. The lemon juice cuts the richness of the dish and the salad added another contrast in texture. I was very happy with the outcome of the dish, the flavors and textures went very well together. 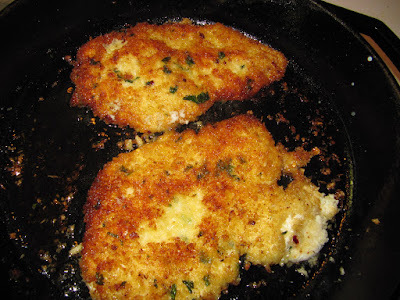 such a classy version of fried chicken - love how you added the parsley and spices to the panko. i don't usually think to use panko with non-asian flavors but this is brilliant!